Stane is in a Board of Directors meeting for Stark Int’l. He unveils a new, very destructive, weapon to limited fanfare. The Board makes it clear that Stane is on his way out of the company and that without suits similar to Iron Man, he might as well just quit. As the Board meeting ends, Ghost appears in Stane’s office. Apparently he has been hired to obtain those very specs. After a short scene in the school, Tony is seen out testing the limits of his new armor. He is interrupted by an EMP bomb that was placed on a police chopper that he saves from crashing. Ghost had placed the charge to lure Iron Man into revealing the location of the Armory when he returns there to analyze the bomb. Ghost follows him through all of the security measures into the base. There he finds out the secret identity of Iron Man, Tony’s greatest asset. Tony tries to lock up his armors, but Ghost steals the specs right from Tony’s computer systems. Taking his helmet to keep the armor from being complete, Ghost bids him farewell. Tony quickly suits up in spare armor specialized for covert ops. He calls Rhodey frantically to get his help in retrieving the specs and in taking down Ghost. There are some great chase scenes, ending up in Ghost fighting both Iron Man and War Machine in the center of downtown. Using a trick where he creates hard light copies of himself, Ghost has multiple copies of himself fight the two armored heroes while he escapes completely. After admitting defeat, Tony reveals to Rhodey that his identity has been compromised. The two decide to return to school and come up with a plan. At school, Tony is racking his brain as to where Ghost might go with information that he gathered. (There is also a nice Captain America nod during Tony’s history test. Very cool.) He has an epiphany and realizes it would have to be Hammer or Stane that would have wanted the information and have the pocketbook to make it worthwhile. He takes off to suit up and head to Stark Int’l before Ghost gets there. He arrives to find Stane giving an update to the Board of Directors, showcasing his armor specs. 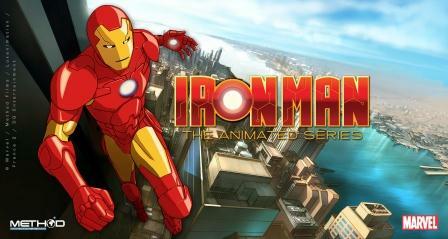 After freaking out, Iron Man jets to Hammer Industries to find he was too late again and that Ghost is double dealing. Ghost tries his hard light trick again to confuse Iron Man and make another getaway, but Tony has already reconfigured his system to identify the fakes and disable them. In seconds he has Ghost down. Ghost explains that he did not sell out his identity, but that it is a fail-safe. If Ghost dies, it will be uploaded to both Hammer and Stane. And when Tony turns 18 his plan is to blackmail him, so that he will have access to the Stark Int’l fortune. Ghost fades away leaving Tony to contemplate his next move.